Throughout the history of American automobiles the full-sized pickup truck has been the backbone of the industry. Americans love their trucks, and two names, Ford and Chevy, have regularly been the best sellers in this industry. Intense competition between these two manufacturers has brought some of the industry’s best innovations to market. Ford and Chevy have been at it again with new announcements and introductions for 2015. The result is a steep discount on one of Chevy’s most popular trucks – the Silverado. General Motors Co.’s Chevy Silverado has been marketed with the phrase of “high strength steel, for high strength dependability.” This full-sized pickup has been marketed as the ideal choice for rugged work, because steel provides a strong base for a strong truck. The marketing has worked, but Ford wants a piece of the pie. Earlier this year Ford launched a new version of its F-150 pickup. The new truck is made partially from aluminum, which is pushing the question about whether steel or aluminum is better. Chevy only has one main way to respond to the new F-150, and that’s to simply claim “steel is better.” Consumers, however, would have to make that determination for themselves. 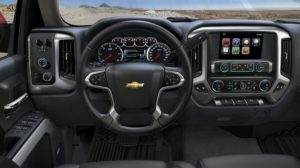 To help improve sales in light of this launch and remain one of the top-selling pickups, Chevy has chosen to significantly discount the Silverado, so fewer potential buyers will be swayed by the “new and improved” F-150. Customers interested in the Silverado are able to save as much as $8,000 on the purchase price through the aggressive discount package. For those purchasing the 2015 Silverado Crew Cab LT All Star 4WD, discounts include a $4,250 total allowance. Chevy then added a $3,000 factory reduction pushing the truck below the manufacturer’s suggested retail price. On top of that, a $750 option package discount is also available. This adds up to a substantial $8,000 reduction on the purchase price, which is between $27,365 and $36,115, depending on the features the customer wants. Chevy is aggressively discounting its Silverado in an attempt to remain one of the best-selling vehicles in the country. The F-150 and Silverado regularly vie for this title, with the Fiat Chrysler vehicles and Ram full-sized trucks following just behind them. The new F-150 launch could easily pull some of the sales from the Silverado. Chevy is hoping that the $8,000 discount will spark the attention of some buyers and keep them in the Chevy camp. The new F-150, which went to market earlier this year, represents a risk for Ford. This is the first time that a large, aluminum pickup truck has been offered to the general buyer, and the reception has yet to be tested. Ford is hoping to see a huge demand for its “innovative” truck, but it may end up having to discount the truck to hold its place in the market if the demand is less than expected because buyers are not impressed with the new design. To help, Ford has planned to only build enough of the trucks to meet the demand as they go to market. Sales for the F-150 should be posted this summer, so investors will be able to see whether or not the risk has paid off. Those in the market for a new truck this year will have to decide for themselves which of the two options is better. For some, the appeal of the aluminum truck and the other new features of the F-150 will win out. For others, the $8,000 discount package for the Silverado will not be something they can ignore. Soon, when summer sales numbers start rolling in, we will all know which manufacturer’s decision won the day.